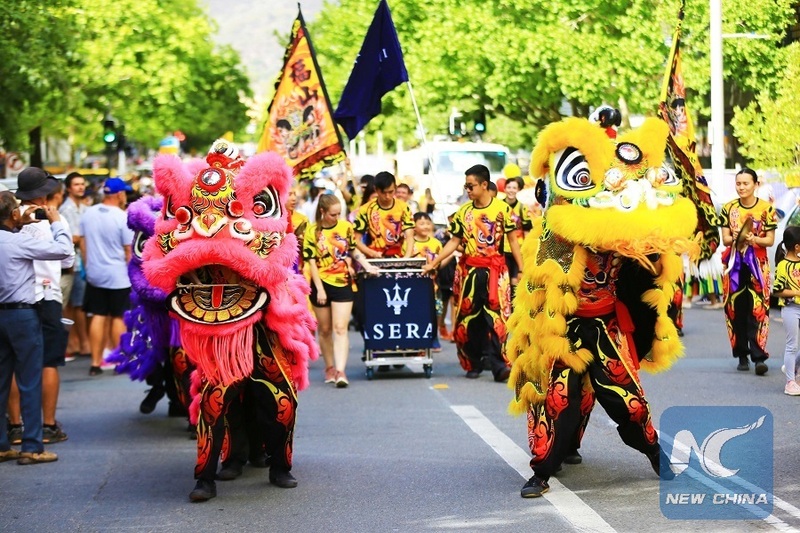 CANBERRA, Feb. 17 (Xinhua) -- Vigorous dragon and lion dances, demonstration of gorgeous traditional Chinese costumes, and peaceful Chinese music attracted hundreds of visitors at the annual Australian National Multicultural Festival. The festival, which runs from Friday to Sunday, is in its 23rd year. "It is Australia's largest multicultural festival," said Chris Steel, Australian Capital Territory (ACT) Minister for Multicultural Affairs. "It is a proudly community-based festival...with three hundred stalls and fabulous programs with 2,000 performers in three days." A total of six stages featuring 150 acts were set up, among which the Chinese stage, or known as the China Village, was in Ainslie Place at the heart of Canberra. "We have sponsor this year and the stage is about one-third bigger than last year," said Sam Wong, Chair of Canberra Multicultural Community Forum Inc.
Wong, who was also a host at the stage, told Xinhua that more than 20 groups in Canberra participated in this year's China Village performances, plus five from elsewhere in Australia and three from China who came especially for the event. Among the performers some were locals, like Caroline Giddings. In a blue Qipao, or cheongsam, and dancing elegantly, the elderly lady was proud to be on the stage. "It is very good for old person to come along to do something different," she said. "It is about different culture, and learning to get along with other people. I have some Chinese friends, and I have Chinese friends doing Taichi." 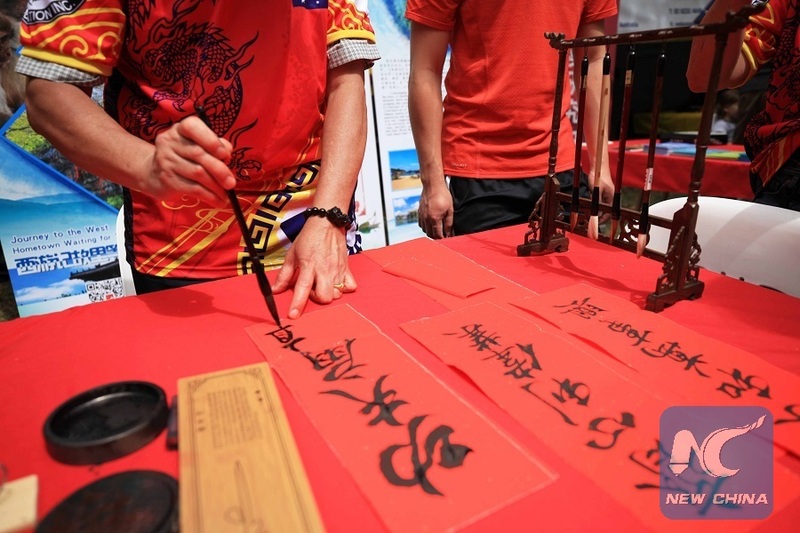 In spite of the scorching sun and the high temperature exceeding 30 degrees Celsius, visitors, Chinese and foreigners alike, watched attentively, applauded and took photos while enjoying the show. "I think there is a wonderful performance going on," said spectator Marlene Reud. "I have been enjoying the music, and especially last night the women's orchestra is absolutely amazing, with those traditional musical instruments. I really am impressed." Reud said she didn't know much about Chinese culture, but at the festival she was impressed by the music. "And the color of very vibrant culture," she said. At the opening ceremony of China Village on Saturday evening, Chris Steel said it "was fantastic to have so many performances from China coming to the festival, to strengthen the festival, and strengthen the relationship between our two nations." "Our Chinese community around Australia are 1.2 million," said Zed Seselja, Assistant Minister for Treasury and Finance. "Their focus on hard work, entrepreneurship, their focus on family, community, and their focus on retaining the heritage are making an amazing contribution to Australia." His view was echoed by Senator David Smith for the Australian Capital Territory. In an interview with Xinhua, he noted that the Chinese community is making so much contribution, from art and literature, to the cuisine and people's way of thinking and philosophy. "The Chinese people here participated in the social development," said Yang Zhi, Minister-Counselor for Culture at the Chinese Embassy to Australia. "At the meantime, they love culture and this festival provides a platform for them to showcase the Chinese culture." Yang has been in Canberra for three years and he saw a growing influence of Chinese culture overseas, a change observed by Wong, who has been in Australia for decades, as well. "Nowadays the Australians love our Chinese food and they go to travel in China," he said. "We could easily find Chinese products in the supermarkets. Australians now know China better."